Where's Becky? Volume #1 (Retired). The history, design, and story of the original version of "Where's Becky?" With the new version of "Where's Becky?" finally open (which we are referring to as "Volume #2"), I thought it might be interesting to recap the original "Volume #1" version of the room, why it was changed, what worked and what didn't, how it evolved, and some funny moments contained within it. NOTE: I will be leaving certain things out of this post to avoid any potential spoilers that might relate to Vol#2, as we did retain some cool tech elements and the same basic room layout (but everything else is new & different). Back when I was first planning out which rooms were going to be designed, there was a lot of brainstorming, but two ideas stood out for this particular room. 80's teens slasher, and "Cabin In The Woods" style multiple endings. The idea being, that depending on the player choices in the room, they would get slightly different stories with vastly different endings. The room was considerably lower tech than the others (in spite of two cool tech things we kept), and included a lot of word/number locks, a lot of reading, multiple books, a blacklight (for searching), and the worst offender, a way to lose the game (somewhat) prematurely if you made the wrong choice. Needless to say, I was ashamed of this room, especially compared to the other two (which used considerably more cool tech). It didn't take long before we knew it needed to be fixed, but the fix was more of a giant band-aid. 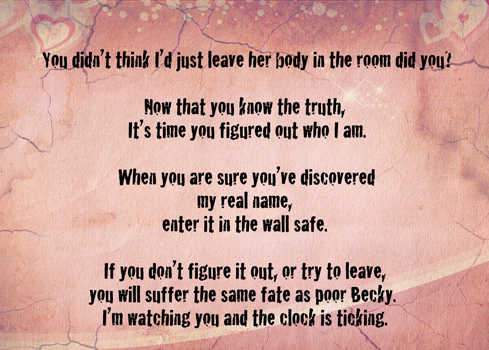 As far as the story goes for this room... you are friends of Becky (who has gone missing) and you got a note to come to her bedroom. You find a note and quickly discover that her/your friends are all dead (or being murdered right now). Expecting to find her body, you instead discover a note from the killer taunting you as the next victims unless you can determine their identity. 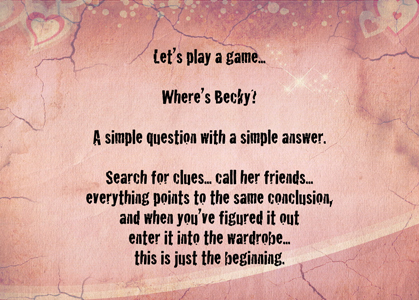 This point leads to a number of "suspects", which all lead back to Becky. She's killed everyone and if you didn't discover that, she's coming to kill you (as our staff member enters the room after time has expired). If you did discover her as the killer and completed the final task, she then frames you for the killings (your fingerprints are all over the knife) and the police are on the way. In the original version, each of the 4 killers had their own good & bad endings. 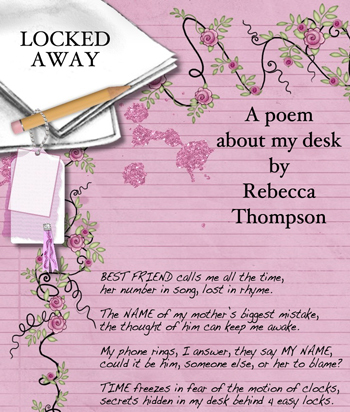 In the months after we opened, I spent a lot of time in Becky's room, going over every element, recalling all the feedback, and plotting out how to fix it. 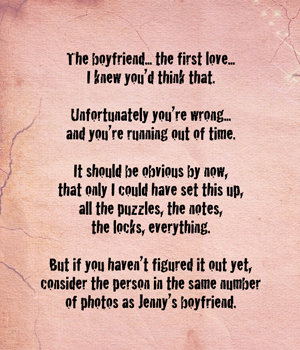 We had a diary (that got destroyed through light usage), and many of the puzzles were just too hard. A lot of things had to change, including the array of multiple endings that left players wondering what if they had made a different choice, and leaving certain bits of information to seem like red herrings. In the original version, there were going to be 4 killers, here's a sample of their audio. Since I didn't want to change the core story, I decided on a "real killer", and changed the other options to lead back to the correct solution. I replaced the "diary" with some shorter notes, and altered a bunch of puzzles to make them easier and/or requiring less "busywork". 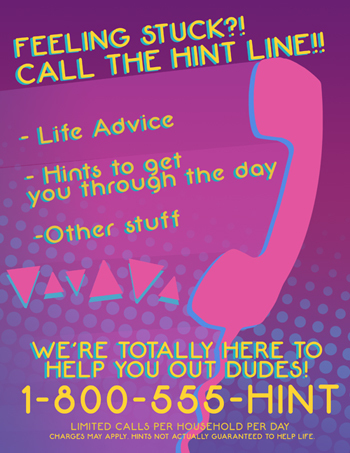 I re-recorded a ton of the audio (including the entire hint system, replacing the hip "radical" help line guy), got rid of the ability to "fail" the room, and did the best I could without throwing away everything and starting over (because I really did like the story). Ultimately, the room ended up being "above average" for local escape rooms, and great for new players, but still clearly our least good room and below my personal standards. I was no longer ashamed, but I wasn't proud either. It was just "the other room" that we rarely recommended. Of course, for all of the bad things about the room (mostly things that experienced players would frown upon), it did have some highlights. The look on people's faces when they hear Becky's best friend getting murdered (which was usually the turning point of their discovery of what kind of story this was). 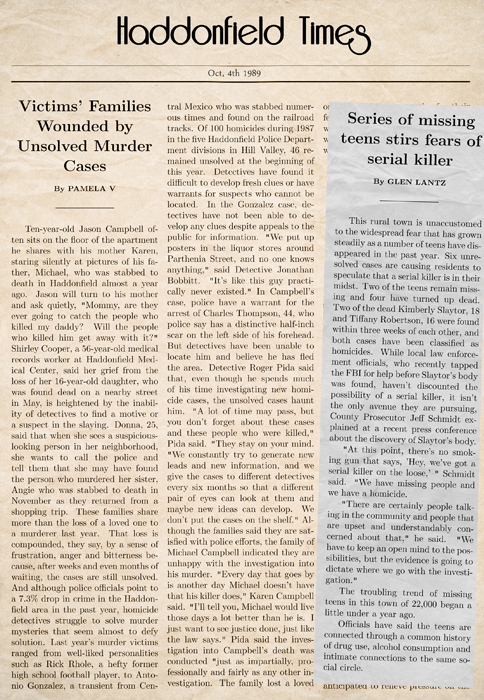 The newspaper clippings full of humorous 80's slasher tropes and names familiar to fans of the genre. The discovery of the killer and the way the ending played out when the time ran out and staff entered the room (especially if players were holding the knife). There was even a picture of me in the room. One time, one of our staff members noticed someone in this room using a lighter, a huge problem and strictly forbidden for obvious reasons. When she confronted them on why they were using it, their reply was... "we were lighting our farts on fire". So, that happened. It was clear that this room would be the first to change, and planning for that started over a year ago. I've always been a fan of 80's horror films, so I may go back to that genre in a future room design (especially a "pop-up" room), but it was time to shift gears (and emotions). It was time to put locks completely behind us, throw away the blacklight flashlight, and say goodbye to Version #1. It was an interesting experiment with multiple story paths, and a lot of fun at times, but I knew there was so much more that could be done with the theme, and done much better. I had a completely new story idea that people responded well to, and would allow me to eliminate everything I hated about the old version, while keeping the elements that everyone loved (using them in different ways), and let us keep the same core concept and room design (Nostalgic 80's teen girl bedroom). We may forever continue doing future Where's Becky? "Volumes", possibly going into the 90's, or even something historical like "Where for art thou Rebecca?". In the meantime though, I'm pretty happy with the new version. I'm sure, just like the other rooms, that I'll still be tweaking it for years to come, but for now... it's done... and I'm finally proud of it.